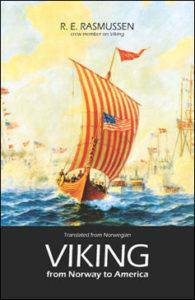 At the conclusion of the World’s Columbian Exposition, Viking was towed through the Illinois and Michigan Canal and down the Illinois River to Grafton. She then sailed down the Mississippi River to New Orleans. Viking remained in New Orleans over the winter. Never able to complete her journey around Florida and up the East Coast to Washington, D.C., Viking was towed back to Chicago. After her return, the Viking sat beside the Field Columbian Museum (now the Museum of Science and Industry) Here Viking was neglected. 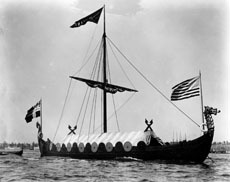 Would anyone know the dates the Viking was towed down the Illinois & Michigan Canal after the World’s Fair? Yes, Charles. The ship entered the I&M Canal on November 2nd, 1893 and exited November 10th. One more question. Did the shields mounted on the ship have a design on them?